The Surge is an action RPG set in a heavily dystopian future, where time on Earth is nearing a close. Developed by Deck13 Interactive, the team that created Lords of the Fallen, you play as a worker struggling to survive in a vicious world wracked by environmental disease, only aided by your super-powered exoskeleton. During a preview, we got to check out a teaser for the story and get a closer look at the game’s interesting combat system. In The Surge, the developers wanted to base their world building on social and technological predictions of the future, to create an Earth based on humanity’s current trajectory. Elements like politics, the economy, and technology blend in a mélange of dystopian reality. The preview began with our protagonist in a junkyard-like area. All around us was disused tech, large containers, and refuse-ridden ground. We soon discovered that he is there as part of a huge government funded project to restore the Earth’s atmosphere. All he knows is that one moment he had joined a company, then blacked out and woken up in this place. Without further meandering, our protagonist soldiered forwards, coming up to a way station that he can’t yet enter. These stations function like home hubs. Here, the player can level up and craft items, the latter being a big part of the game. The small area around us, hemmed in by towering containers, seemed eerily deserted. However, only moments later we found out that we’re not alone in this place. A shambling figure in a similar exoskeleton stalks towards us. However, with his deathly, somewhat zombiefied pallor, not to mention the huge and menacing drill on his arm, he’s not there to play nice. This encounter gave us our first glimpse at The Surge’s combat system. Combat functions on a 1-vs-1 basis and forms one of the pillars of the game. The encounters are set up to be technical, with a set of familiar elements: stamina, block, horizontal and vertical strikes, the ability to dodge, etc. The different types of strikes you can do add to things like juggling, so you can get the upper hand. 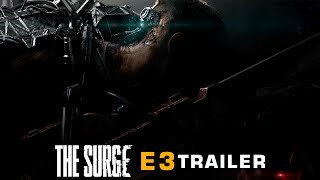 In combat, The Surge attempts to set itself apart from other similar action-RPGs through a targeting system. Think of this like your V.A.T.S. tech in Fallout; or, if you want to think of something else, then imagine the limb targeting system from Vagrant Story. When in battle, you can choose to focus on different body parts: head, arms, legs, torso. You can change this on the fly. And the purpose of this? One reason is to focus on unarmored portions of your enemy, say, the rear of their leg. Another important reason is because specifically targeting body parts is how you acquire new items and weapons. Back to the first enemy, and he’s dispatched with a swift vertical strike, launching him into the air. This is then followed up with some rapid horizontal slashes. As we progress further, we run into our next enemy. We target his unarmored legs, whittling him down until he falls. Then, we focus on the building ahead, which contains a few of the only sane people left in this strange facility. Moving on, close to the factory walls, our next enemy is ready to tango. This enemy, however, has a helmet, and we could really do with one of those. So, utilizing The Surge’s targeting system, we focused on the man’s head with our axe, the final flourish decapitating it in an arc of blood. As you battle, you fill up a combo meter, which can be used to execute powerful synergy moves, such as the decapitation. In battle, with this loot system, you have to weigh up whether you want the loot or the quick kill. Just remember: 90% of the equipment you’ll get in the game will come from enemies. We were able to get closer to the facility’s door, where we encountered a robotic scorpion. Instead of wailing away on this robot, we had to dodge and time the blocking of attacks to deflect its powerful tail. With the scorpion fizzing and sparking on the floor, we reached the door. On it, there is a “1” switch, and previously, we encountered a number of other doors with numerous, higher numbers. This means that you’ll be revisiting hubs, when you have higher clearance to access newer areas. Inside the factory, we made use of a “ladder”, which zips us up to the next level without the need to climb. As we wended our way around, another human enemy stood in our way. This character, with its twin blades, acts like a rogue class—it's fast and agile. However, we were able to take it down while stealing its deft set of dagger plans for our own. After making it through the facility, we dropped back outside—right where we began, near the way station. Now we entered the facility and utilized the crafting bench. The bench works like old school RPGs such as Diablo, in that you have to firstly identify your loot. We examined the dagger-like weapons from our last enemy and equipped them, ready to take on a boss battle. Heading back out and taking a few turns, our protagonist was ready for a scrap. 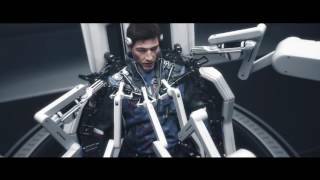 There were no cutscenes in The Surge, so as not to break the flow of gameplay. The boss, like some kind of giant mechanical spider, had the sort of move set you’d expect. It’s fast, can leap, and has some powerful, stabbing attacks. The way the boss battle functioned was that we had to wait until a “warning system” bar filled, which occurred when we attacked it. When this happened, the robot fired a barrage of cluster missiles. When this moment presented itself, our protagonist slipped under the creature, sending its missiles back on itself. With the damage done, the robot was weakened, allowing us to unleash a few well-placed strikes on it. Rinse and repeat. And what does put an interesting twist on boss battles is the aforementioned idea of risk and reward. If you want specific schematics from powerful creatures, then you’ll need to focus your attacks on those appendages. 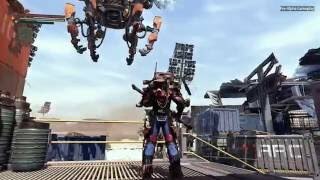 The Surge seems to be an interesting take on the well-worn 1-vs-1 third-person action RPG. However, what could make or break the experience is just how deep the weapon and loot selections go, and how much variety each of the location hubs offer. To be honest, what was most interesting about the game was Deck13’s take on a dystopian society, and, if done well, could be a very interesting journey. The Surge is expected to release on PC, Xbox One, and PS4 in 2017.